This is something that I did not want to happen for a very, very long time. 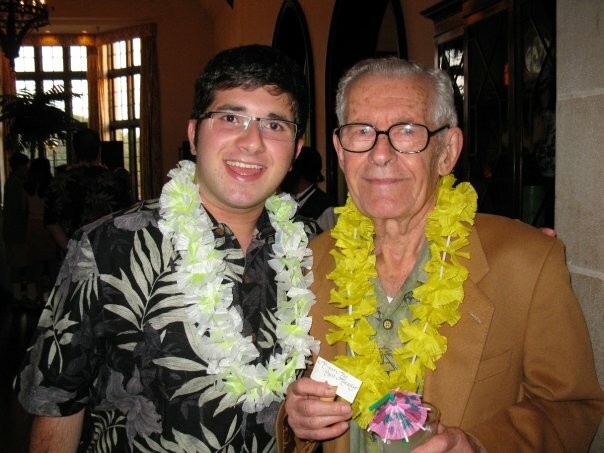 For 26 years, my grandfather, Ralph Matzdorff, was a constant light in my life! I always remember whenever Mom panicked about the broken refrigerator, toilet or electrical appliances…we called him: our Super Fixer-Upper! For a fee of a turkey or chicken salad sandwich, he would come over and worked his magic (which was anywhere between 10 to 45 minutes) and the house was back to normal. During our lunches, Aaron and I would also share what happened at school that week and talked to him about anything from his experience in China to the latest in the Jewish world. He was also the person that both Aaron and I turned to when we faced some of our monstrous scout and school projects! For five years, Aaron, Grandpa, Dad and I, tinkered down in his basement as we made multiple Pinewood Derby cars. Some were successful…others were not. But, there were priceless memories! Another priceless memory that I have of my grandfather is my 5th Grade Grandparents project! Mrs. Johnston assigned each of us to learn all about a grandparent. Without a doubt, I thought of grandpa. He shared his memories of him; Omi and Great-Grandpa Paul escaped the Nazis two days after Kristallnacht and his days growing up in China. He also told me about when he learned his trade as an electrician and how he got to the United States and met both my late grandmother, Sophie and my grandma: Adele. When it came time for the special day, there was only one grandparent that was in the audience…my grandpa! At my apartment, there is a photo that I look at daily! It is a photo of Aaron and I with Grandpa and Adele at our Eagle Scout Ceremony. It meant the world to both Aaron and I that he was there to celebrate our momentous occasion. He also beamed with joy as he watched my countless school musicals, Aaron’s marching band performances and our graduations from Blue Valley Northwest, CU and Arizona. When I tell my children about their great-grandfather, I will share with them all of the wonderful memories that I had with him and how he was one of the kindest, strongest and smartest men that I ever knew. Goodbye Grandpa…I know that you are with Grandma Sophie, Omi and Ike. Please give them a hug for me and I will see all of you soon…. but not too soon!